High above the town of Stowe on 2500 secluded acres is a gracious resort that recalls the alpine homeland of its Austrian owners. 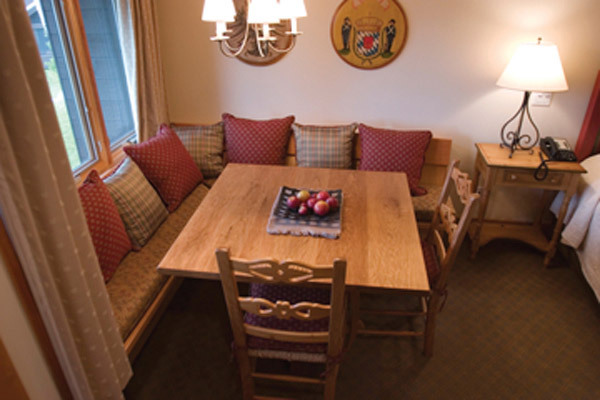 Originally the von Trapp family's home, the Trapp Family Lodge has since become a year-round guest retreat, where the family’s musical legacy lives on. The old-fashioned delight of sing-alongs and evening summer concerts in their scenic meadow recalls family traditions that were the inspiration for “The Sound of Music.” Feel the magic of the Austrian alps as you follow a winding mountain road from The Lodge to your private villa, The villas sit on their own 61 private acres within the overall resort property. From the pitched gable cedar roofs that first come into view, to the soaring ceilings, exposed beams, light-suffused rooms, your residence evokes the elegance of a European villa and the charm of a Vermont retreat, all with plenty of room for extended family. While skiing here is the world-renowned pastime, in warmer months you will enjoy the solitude of hiking trails and the newly added mountain bike trails that wind through meadows and woodlands. Your whole family will enjoy the scheduled daily activities, including art and music classes, and for some pampering, relax with a yoga class or massage therapy in the fully equipped Fitness Center. Whatever your pleasure, at whatever time of year, from the moment you arrive, the hills are alive with the sounds of family fun. When the von Trapp family left Austria and first viewed the sweeping mountain vistas of Stowe, Vermont, they found a new home here. They welcomed their first guests to their lodge in the summer of 1950, and the family has been hosting visitors ever since. The von Trapps are continually expanding their trail system, currently amounting to approximately 60 miles of trails with terrain suitable for every level of Nordic skier or snowshoer, for some of the best cross-country skiing in the nation. "The grounds at Trapp Lodge were beutiful and well maintained..."